In potentially big news for the international development of Australian Rules football, the AFL have revealed preliminary plans to allow AFL clubs to take on young international players as apprentices. The initial discussion is being treated as a background issue by mainstream Australian media, with the high profile issue the AFL's plans to have a similar scheme in Sydney. The AFL is still working on the system in consultation with the clubs. The main focus is to give talented young players around 14 to 16 a pathway to the AFL. Young players are often drawn away to higher profile sports in the competitive Sydney market, with Union, League and soccer strong sports. But in amongst these ideas the AFL has indicated that they will also allow international youngsters to be developed. This could be a great next step for international leagues and could provide a lot of additional motivation to promote juniors. Hopefully it will keep young players in the game, and also open the minds of the Australian footy public to the potential for the game. The Age's Caroline Wilson suggests in her article that "in an attempt to develop the game beyond its traditional strongholds, the 16 clubs will also be given the option of procuring a second, international player who would be brought to Australia and given the opportunity of a sporting scholarship at an exclusive school". Game Development General Manager David Matthews indicated South Africa, New Zealand, Papua New Guinea and Denmark would be the most likely areas of attention. Essendon chief executive Peter Jackson was quoted as saying "We would certainly look overseas". The full article can be found here (after a time users may need to create an account at The Age's Real Footy to access the story). I find it hard to understand why the AFL isn't also looking at Canada and USA. I fully agree, the potential of the North American market is too large to ignore. 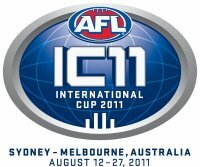 Perhaps some AFL recruitment officers will attend this years International Cup and therefore broaden their horizon a little. The article mentioned countries that already have high school competitions, as the scheme applies to young to mid teens. As soon as these appear in Canada and USA they should qualify too.